Bill Maher : Religulous ~ A Documentary Film On Religion ! 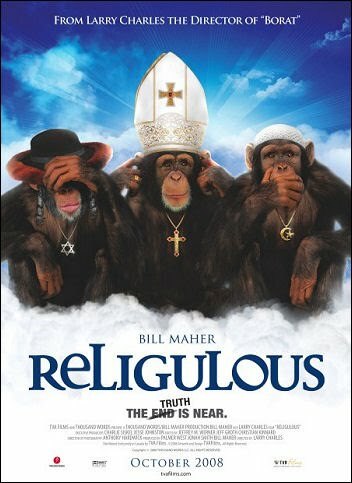 Religulous is a new comedy documentary movie from director Larry Charles ('Borat', 'Seinfeld') & Comedian/TV host Bill Maher ("Real Time with Bill Maher," "Politically Incorrect") who take a pilgrimage across the globe on a mind-opening journey into the ultimate taboo: questioning religion. Meeting the high and low from different religions, Maher simply asks questions, like "Why is faith good?" "Why doesn't an all-powerful God speak to us directly?" and "How can otherwise rational people believe in a talking snake?" For anyone who's even a little spiritually curious, this divine entertainment will deepen your faith... in comedy ! 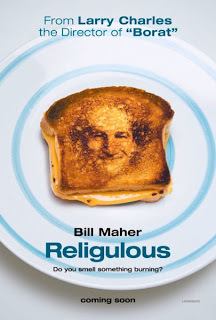 Bill Maher interviews some of religion's oddest adherents. Muslims, Jews and Christians of many kinds pass before his jaundiced eye. Maher goes to a Creationist Museum in Kentucky, which shows that dinosaurs and people lived at the same time 5000 years ago. He talks to truckers at a Truckers' Chapel. ( Sign outside: "Jesus Loves You" ) He goes to a theme park called Holy Land in Florida. He speaks to a Rabbi in league with Holocaust deniers. He talks to a Muslim musician who preaches hatred towards Jews. Maher finds the unlikeliest of believers and, in a certain Vatican priest, he even finds an unlikely skeptic. One The Movie : Towards A Timeless Destiny !